Lloyd has worked as a producer, co-producer and arranger for such artists as: Diana Ross, El deBarge, Cheryl Lynn, Brownstone, TLC and Dee Harvey. 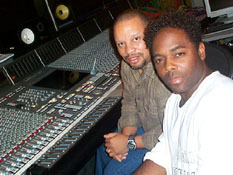 He has provided digital editing for Norman Brown on his cover of the Stevie Wonder hit, “Too High.” Lloyd also worked on arrangements for Smokey Robinson and Teddy Pendergrass. He served as a computer technician on a Stanley Clark project. Topping off this list of great accomplishments, Lloyd produced, “I Like it Like That” for the movie “Coming To America,” starring Eddie Murphy and Arsenio Hall. Much of Lloyd’s musical inspiration was also a direct result of close exposure to one of the top producers in music. His uncle, James Carmichael, a Grammy-award winning producer/composer, introduced Lloyd to the world that eventually became his destiny. Following his graduation from USC, Lloyd worked for his uncle learning first-hand the subtleties of becoming a premiere producer. Little did he know that the many studio sessions he was privileged to be part of would help develop the amazing creative talents that have become the core of what Lloyd is today. Well-versed in computer technology as well as music arrangement and production, Lloyd was given the opportunity to produce six tunes for Bobby Womack’s mid-‘90’s release, “Resurrection.” In 1994, he worked on a re-mix for the tune “Janet” by Bobby Caldwell. Lloyd took all of the vocals off of this song and created an entirely new track around them. He performed in a similar capacity for Toni Braxton as he transposed a tune from the album, “Secrets” one half step and pitched up the background vocals. In 1997-98, Lloyd completed his work on the final mixes for the Lionel Richie project, “Time”. The collection featured three tunes, “Stay,” “Zoomin’,” and “Touch,” that were played on and arranged by Lloyd and co-written with Lionel Richie. He was also hired to create a re-mix of “Let Me Take You Down”, a track which was originally written by Jimmy Jam, Terry Lewis and Lionel Richie. In 1999-2000, Lloyd once again collaborated with Lionel Richie on his most recent project “Renaissance”. His role as a writer, producer, arranger and musician on the track “Don’t You Ever Go Away” displays his versatile creativity. In 2000-2001 Lloyd once again provided his musical magic for two feature film projects. The cable television movie “Love & Action in Chicago” starring Courtney Vance and Regina King, featured three original tunes “Baby, Baby”, “Give It A Try” and “Let Me Love You”, which were written and produced by Lloyd. An additional film project to benefit from Lloyd’s melodious talents in the form of the tune “How Did We Come to This”, was the Screen Gems/Sony Pictures production of “Brothers”, starring Morris Chestnut, Shemar Moore and Bill Belamy. Musical adventures for Lloyd Tolbert began when he started studying music and playing drums at the tender age of ten. His skills and dedication soon catapulted him to experience such honors as playing in the Los Angeles All-City Youth Band and become a member of many other notable citywide and regional bands throughout his high school years. Upon graduation, he attended the prestigious University of Southern California. While attending USC, he was a member of the famous Trojan Marching Band. As a drummer with the band he marched in several popular parades including the Rose Parade and Hollywood Lane Parade. He was also a member of the Trojan Marching Band whose services were requested by Fleetwood Mac when producing their hit song “Tusk”. Lloyd graduated from USC with a Bachelors of Arts, with an emphasis in Music. Current credits: Most recently Lloyd has offered his ProTools experties on projects for such artists as Brandy, Yolanda Adams, Sunshine Anderson, Eric Benet, LSG and Terry Dexter. Lloyd is working with the legendary group The Emotions, writing and producing original songs that would re-introduce the trio to their existing fans, while creating a new generation of music followers. Tolbert & mixer/engineer Ralph Sutton collaborate together and are developing new artists.